The beginnings of the Autumn break in the South has placed a floor under cattle prices during the last week with the Eastern Young Cattle Indicator (EYCI) gaining 1.3% to sit just below 490.5¢/kg cwt. Victoria has received some good rain in recent days but the benefit of this change in weather has not been able to extend further North into NSW. Across the national sale yards most categories of cattle have gained value. The National Trade Steer indicator increased 3% to see it sitting at 284¢/kg live weight, although outclassed by Medium Cows that managed a 5% rally on the week to 357¢/kg live weight. National Heavy Steers one of the few classes of cattle to soften this week albeit marginally, staging a drop of 1% to 267¢/kg live weight. East coast cattle yardings are 20% softer week on week, reflective of the improved conditions in the South – Figure 2. NLRS report East coast cattle yarding levels of 54,360 head which now sit comfortably within the normal seasonal range for this time in the year and is only 3.6% above the five-year seasonal average. 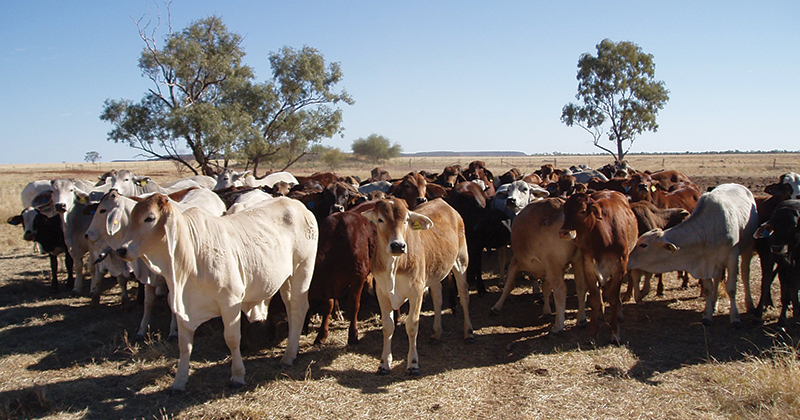 However, NSW is yet to benefit from the recent rains in any meaningful manner and cattle prices will struggle to gain significant traction while it remains dry here and NSW cattle yardings remain elevated. Figure 3 outlines the recent pattern in NSW cattle yarding with current throughput levels 40% higher than the five-year seasonal average and 37% above the level set this time last season. The rainfall forecast for the next week shows light falls are set to continue in Victoria and along the Eastern seaboard of Northern Queensland. Unfortunately, the rest of the country (and sadly NSW) miss out again. It’s difficult to see a decent mid-Autumn rally in cattle prices beginning while it remains so dry in much of the country. Further sideways price consolidation is anticipated for the week ahead, despite improving beef export prices offshore.